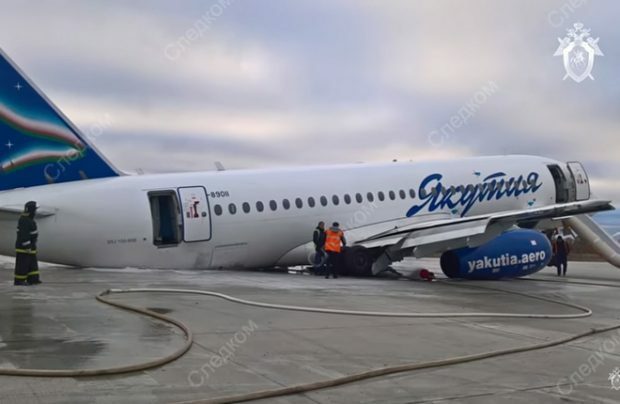 A Sukhoi Superjet 100 regional jet (registration RA-89011), operated by Russia’s Yakutia Airlines, overran the runway at Yakutsk Airport on October 10. No fatalities or serious injuries were sustained by any of the 96 passengers and crew on board, in an incident that may have been caused by poor braking action on the icy Yakutsk runway. However, the aircraft was damaged beyond repair. A source close to the investigation has indicated to Russian Aviation Insider that, on the day prior to the accident, the runway was covered with wet snow that then turned into ice overnight. The runway’s braking effectiveness was therefore purportedly lower than the aircraft’s permitted limits. The SSJ100 overran the working part of the now slippery runway and came into contact with a raised section under reconstruction, causing the landing gear to collapse. The accident occurred on October 10 at 03:20 local time as the SSJ100 arrived at the airline’s base airport after operating domestic flight 414 from Ulan-Ude. All the 91 passengers and five crew evacuated via the emergency slides, and four people reported to the airport’s medical office for assistance, the airline has revealed. After the touchdown and landing run, the aircraft overran and failed to avoid a part of the runway currently undergoing reconstruction. At the time of the accident, visibility was 10 km, the ceiling at 600 m and the runway’s friction coefficient was reported as a freezing temperature of 0.45. However, the source has since revealed that the braking action may have been below that indicated by air traffic control. Preliminary calculations show that, due to glazed ice on the runway, it may have been as low as 0.24-0.28, below the permissible limit of 0.3. The runway at Yakutsk is currently undergoing a reconstruction programme, the first stage of which was completed in September. But the process was suspended for the very cold winter period (with temperatures hitting as low as 50 degrees C). Due to the unfinished reconstruction work, a surface bump formed, which reportedly came into contact with the aircraft’s main landing gear, causing it to collapse, according to the source. The reconstruction project is due to be completed in 2020, with a runway extension included in the overall plans. Yakutia Airlines took delivery of RA-89011 in 2012, and the aircraft has since been maintained in an airworthy condition. However, as a result of the accident, it will now have to be written off. Along with this aircraft, Yakutia has five other SSJ100s in its fleet, but only three have been in operation. After the incident, Yakutsk Airport was closed for several hours, with at least three flights forced to divert to alternative airfields, and several outbound flights delayed.